Plant seed dispersal is crucial for the persistence and expansion of plant populations. Most seeds are aided by dispersal vectors, such as wind, water or animals. Such vectors are particularly important in isolated habitats in fragmented landscapes, such as ponds and lakes. Without dispersal between isolated habitats, plant populations may lose their genetic diversity, making them less able to adapt to changes in the environment and thus more prone to extinction. Charles Darwin already hypothesized that waterbirds may play an important role in the dispersal of aquatic organisms. Recent studies showed that indeed many plant species have the ability to stick to the outside of a duck or survive passage through the digestive tract. Indeed, internal dispersal (endzoochory) was found quantitatively more important than external dispersal (epizoochory). However, many of the mechanisms and consequences of waterbird-mediated seed dispersal remained unidentified. During my PhD research (2011-2015) at the Utrecht University, I aimed at gaining a better understanding of how variation in seed and disperser traits affect the scale of waterbird-mediated dispersal. I focused on one of the most potent seed dispersers among waterbirds: the mallard. Mallards are the most numerous duck species worldwide, with a range covering almost the entire Northern Hemisphere. They are onmivorous, foraging on whatever is available. That means that from late summer until spring, seeds are an important component of their diet. During my project, I assessed the three stages of endozoochorous dispersal: ingestion, digestion and transportation. Ingestion - Seeds must be ingested before they can be endozoochorously dispersed. The selection of food items by mallards is the first process that decides which seeds are potentially dispersed. Using a literature research and a diet study in the Netherlands, we found that mallards forage highly aselectively on seeds of sizes up to acorns. They do not selectively forage on waterplant seeds, but also ingest seeds of many terrestrial species. 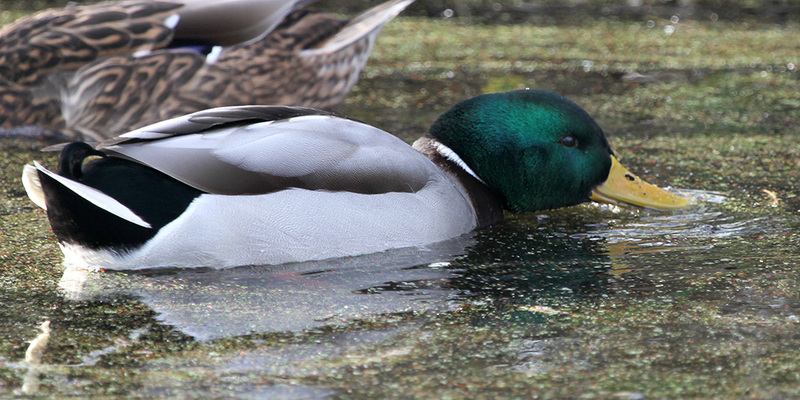 Given the primarily aquatic habitat use of mallards, aquatic and riparian plant seeds do show up in the highest numbers in the digestive tract of mallards. It seems that availability of seeds rather than selection by individual mallards determines their occurrence in the diet. Digestion - Once ingested, seeds must survive the passage trough the digestive tract to become successfully dispersed. We performed a number of experiments to test which seed and disperser traits affect the survival potential of plant seeds. We found that seed coat thickness and permeability strongly, as well as seed size, affect the probility to pass the digestive tract intact. The gizzard, which basically functions as he mallards' teeth, are most limiting for survival, as seeds (especially large ones) easily become crushed. If only the seed coat is damaged in the gizzard, gastrointestinal acids, enzymes and microbes penetrate the seed more easily and reduce its viability rather than destroying the entire seed. Finally, physical activity of mallards (in this case swimming for several hours) was shown to reduce the digestive efficiency and retention times. Mallards swimming close to their maximum speed defecated more seeds intact, at shorter times after ingestion. This indicates that active mallards in the wild may be better seed dispersers than expected based on lab experiments. Transportation - Passing through the digestive tract does not automatically lead to dispersal. For transportation between suitable habitat patches, the mallard has to move. In order to calculate the probability of seed dispersal away from the site of ingestion, as well as the distances over which seeds are dispersed, we tracked mallards across the landscape using GPS loggers. Our results showed that mallards fly regularly between their roost and foraging sites, transporting seeds over several kilometers. We found that mallards cover larger distances in landscapes where less water is available, indicating that mallards play an increasingly important role in connecting disparate habitats when landscapes become fragmented and wetlands disappear. The results of this PhD research are published in a thesis titled "Seed dispersal by a generalist duck: Ingestion, digestion and transportation by mallards (Anas platyrhynchos)", which can be downloaded from my ResearchGate profie. Kleyheeg E., Treep J., De Jager M., Nolet B. & Soons M.B. (2017) Seed dispersal distributions resulting from landscape-dependent daily movement behaviour of a key vector species. Journal of Ecology, in press.